According to reports, former Pakistan skipper and one of the longest-serving cricketers in the modern game, Shahid Afridi, is likely to call it quits from international cricket after the upcoming T20 series against West Indies in the UAE. There have been contradicting reports from Pakistani media outlets with a few claiming that it was Afridi who approached the Pakistan Cricket Board (PCB) to convey his intention to retire while a few are reporting that the PCB is forcing Afridi into retirement. 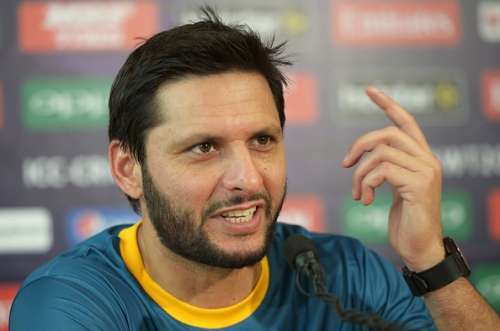 Afridi, who retired from Test cricket in 2010 while leading the side against England, had stepped down as skipper of the Pakistan T20 side after the 2016 World T20 held in India but had announced his intention to continue representing the nation in the shortest format of the game as a player. However, after being overlooked for the lone T20 against England recently, it seems the Pakistani selectors wants the 36-year-old to step aside and give an opportunity for younger players. “Apparently, the board and national selectors feel that Afridi should retire gracefully although he can continue to play in foreign leagues and domestic cricket," Firstpost reported, quoting a PCB source. "The plan is to talk to Afridi and explain to him that since the selectors are now building a new T20 squad for the next World T20 there is no place for him. He will be offered the chance to be included in the Pakistan squad for the T20 series against the West Indies as the 16th player and play in the matches." Considering Afridi’s services to Pakistan cricket – having represented the national side in 398 ODIs, 82 T20Is and 27 Tests over a 20-year span while also being the leading wicket-taker in T20 international cricket at present with 98 wickets to his name – the PCB reportedly wants to give the big-hitting all-rounder a grand farewell before he signs off from international cricket. "The PCB also wants to organise a grand farewell for him in Dubai during the T20 series for which the selectors have already announced a 15-member squad," the PCB source said. However, according to the Tribune, it was Afridi himself who approached the PCB to convey his decision to retire from the highest level of the game as he wanted to sign off on his own terms rather than being dropped from the side. With Pakistan’s next T20 assignment after the West Indies series scheduled only for April 2017, it was reported that Afridi wanted to make way for the youngsters with the future of Pakistan cricket in mind. The report further added that a final decision on the matter will be taken by PCB Chairman Shahryar Khan, who is currently in London undergoing a medical treatment.